Amphibious assault vehicles release smoke during last year's Han Kuang drills on May 25, 2017. A F-16 fighter jet crashed in mountains near Taipei Monday after going missing during annual military drills that simulate a Chinese attack on Taiwan. The wreckage of the military plane was discovered by a hiker, two hours after it disappeared from radar screens on the first day of the exercises, according to Taiwan's official news agency CNA. The pilot, 31-year-old Maj. Wu Yen-ting, was killed in the crash, the Taiwanese Ministry of Defense said Monday. "The military is the guardian of the country and it is a high-risk career ... We will always remember your sacrifices. Your spirit will be with us. We will always be proud of you," a statement posted on Facebook said. The five-day Han Kuang exercises simulate an imminent attack by Chinese military forces on Taiwan, a self-governed democracy which Beijing views as an integral part of its territory. An investigative team is still determining the cause of the crash, CNA said, adding all F-16s had been grounded temporarily while the cause is determined. The air force attributed the crash to "a combination of factors, including poor weather conditions and human error," CNA said. Eight F-16 fighter jets owned by Taiwan have crashed since 1998, according to CNA, killing seven pilots. Defense Minister Yen Teh-fa described the pilot as an "outstanding colleague" and praised his "loyalty and dedication to his duties." The loss of a fighter jet at the start of the live-fire drills is embarrassing for Taipei, which holds the exercises to demonstrate the defense capabilities of its military. Both Taiwan's navy and airforce are involved in the drills. It is one of the largest annual exercises held by Taiwan's military and the drills come at a time of heightened tensions with Beijing. 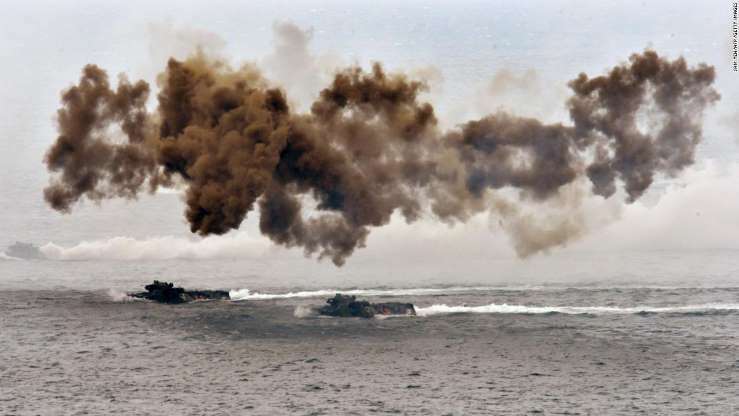 Taipei lost two diplomatic allies in May as Beijing stepped up its campaign to isolate the island, while the Chinese military in April conducted a large-scale show of force in the Taiwan Strait, the narrow strip of water that divides the two. Taiwan's Ministry of National Defense told CNA the 2018 Han Kuang drills were designed to test joint air-sea combat, anti-landing operations in the island's north and south, as well as anti-aircraft operations. On Tuesday, the military simulated a real-time invasion by Chinese mainland forces at different points across the Taiwan Strait.